Friday night, the 4th of March was a wonderful evening for dinner and a skate. We had eight of us sit down for dinner and drinks at Tiff’s in Morris Plains. The food and libations were as good and as flavorful as the conversations we shared. After we had sated our appetites and quenched our thirst, we headed around the corner to the Mennen Ice Arena. We lost two people who didn’t skate, but we did gain one more at the arena. We laced up and hit the ice. After a wobbly, shaky start, we all settled in to the invigorating yet serene gliding around the rink. There was only a small crowd so we had plenty enough room to stretch our legs. Skating is a great form of exercise that helps build a strong core and sense of balance that we rely heavily upon for skiing. Not to mention the alert reflexes needed to dodge teenagers on the ice rink translates directly to dodging teenagers on the mountain. 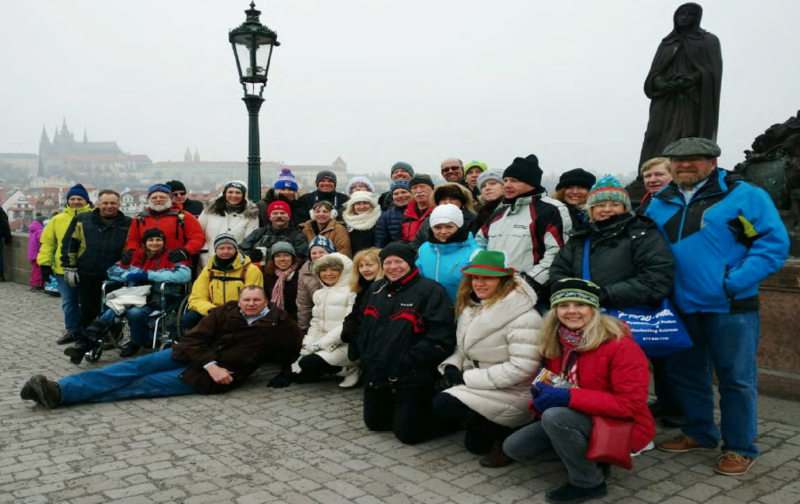 We all had a great time and agreed that we should do this again in the near future. So keep your eyes and ears open for another evening of MCSC on ice. It’s really cool. 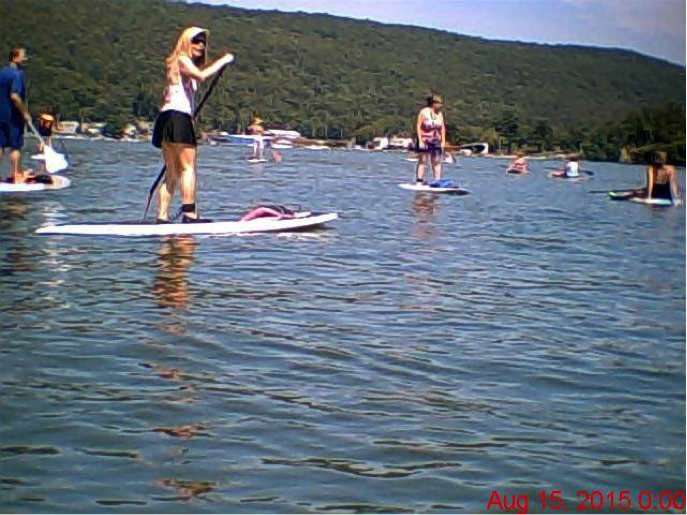 We had a beautiful day for our paddle boarding adventure. 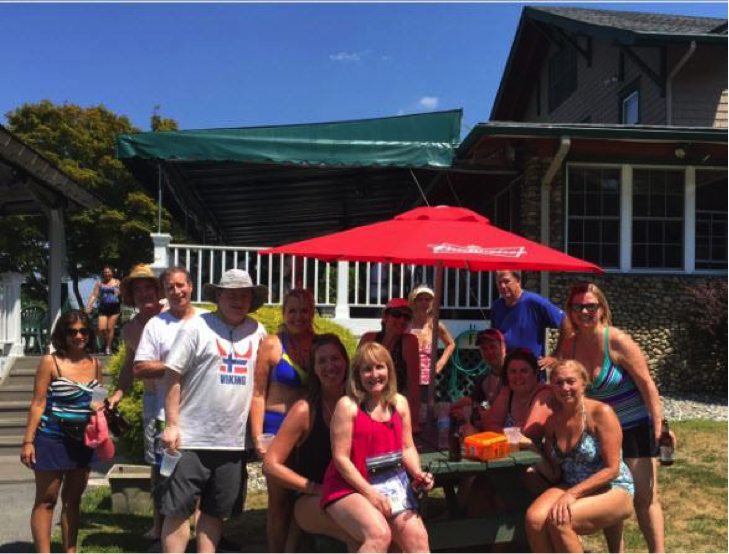 Twenty four members and guests met at Jersey Paddle Boards in Greenwood Lake, New York, just north of Warwick. The skies were blue all day and the weather was warm, but not too hot. We could not have ordered better weather! The group – 24 paddle boarders! We met at 10:30, got checked in and changed. Then we gathered on the beach to be fitted for our boards and paddles. This is where our host, Micki, had her biggest challenge of the day – fitting Doug O’Brien with a long enough paddle! But she got him and all of us set up with equipment and floatation devices and we headed to the beach. 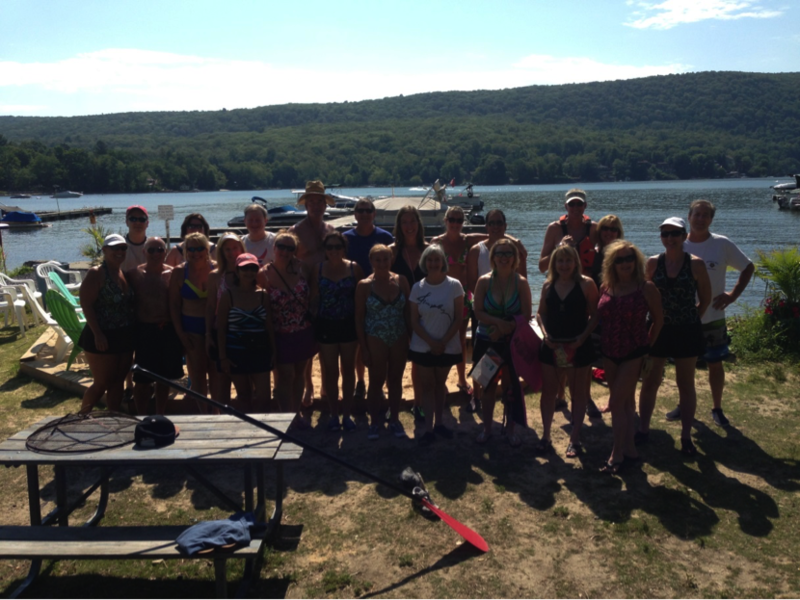 While on the beach, Micki gave us a brief on-shore lesson and safety tips, then sent us to the water. We walked into the water with our boards until we were about waist deep, then we got on our boards, starting on our knees to get a feel for the board and the waves. Then one-by-one we all stood up and made our way across the lake. After turning in the boards and cleaning up, we met next door at the Breezy Point Inn for some lunch. We were able to sit on their patio at tables overlooking the water. It was a picture perfect day! And thank you, Janet, for bringing a camera on the water so we could have some action shots! We all had so much fun we decided to make this an annual event. So watch for it next year! 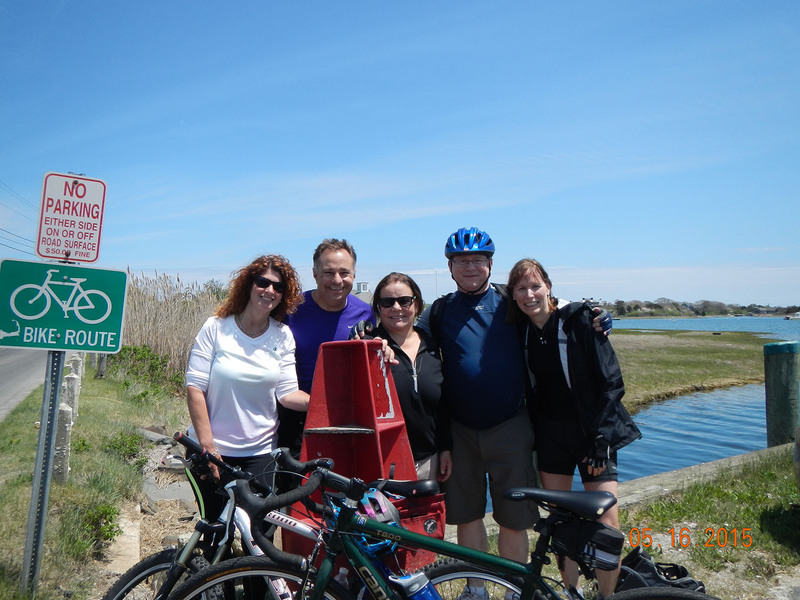 On May 15, the MCSC trekked up to Cape Cod. 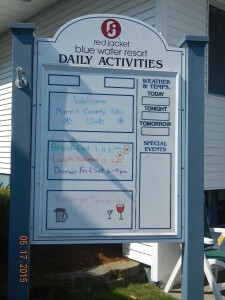 We had a full house with 30 people staying at the Blue Water resort in South Yarmouth MA. 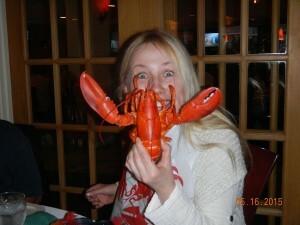 Most of us arrived at the hotel by dinnertime and walked to a local seafood place on Friday night. Saturday morning we started off with their yummy breakfast at the hotel, I was digging the whole-wheat pancakes with fresh fruit. The staff at the resort was so friendly and accommodating, they were very happy to have our club there. At 10 am we met at the southwest end of the rail trail and divided into 2 groups, the short ride had about 20 people and the long ride had about 10. After taking care of some bike triage, flat tires etc. we were off. Thanks Paul, Steve, Dan, Frank, and Rob, you guys are so very generous with helping all of us with the logistics and gear. I led the short ride headed to Chatham, until we hit a fork in the road and accidentally spilt into two groups. Tony and John took on the role of leading that group and making sure every one got back to the parking lot. Chivalry is alive and well in MCSC. Our group stopped off at the Fish Pier, and the lighthouse, and some even had lunch in the town of Chatham. John shared some of these photos on Facebook. 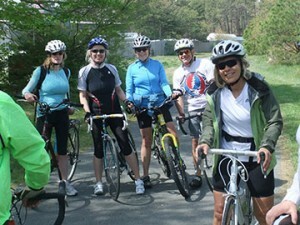 Our group rode between 25-29 miles. Paul and Frank led the long group up to South Wells Fleet. I can’t even summarize what this group did, they did it all. The total mileage was about 55 miles. They stopped for many great pictures which Janet and Paul posted on Facebook. Unfortunately the long group didn’t make it back before the brief rain shower. We returned to the hotel, enjoyed the hot tub and indoor pool a bit, and then got ready for our group dinner. The resort put out a fabulous spread for our Clam and Lobster bake; I think they had enough Lobster for about 40 people. Next it was onto dancing. There was live music in the bar next to the restaurant. Irina our “Russian dancing queen” got everyone up and dancing, including a group of new friends. We closed the place 4 hours later. I am not sure what was more of a workout, the bike ride or dancing. 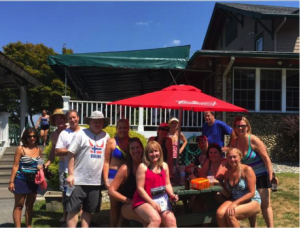 On Sunday the weather was perfect, we all split off and did our own thing. Tony and a small group went to Nantucket for sightseeing. A few went to Chatham for the afternoon. Some stayed at the hotel and enjoyed the pool and the beach. And a few of us headed home early. I only wish we had an extra day there. I would certainly go back again. Thank you all for your help, especially Mary, Paul and Frank. 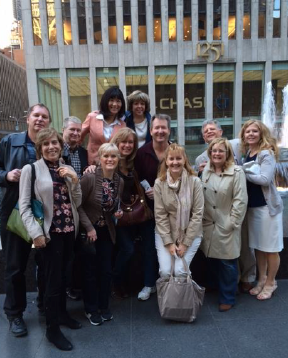 On Sunday, April 12th, a happy group of 20 ventured into The Big Apple on a most beautiful Spring day for the newSpring Spectacular show at Radio City. 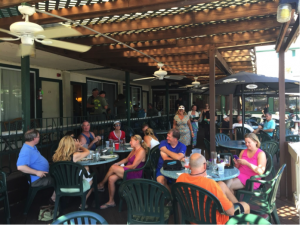 Even before the show, we had a great time gathering at Rosie O’Grady’s for beverages, snacks and socializing! The Spring Spectacular is an all new show containing some super star power with Derek Hough (of Dancing With the Stars) and Laura Benanti (of ABC’s Nashville and The Sound of Music Live) along with the famous Rockettes and a great ensemble of other actors and dancers. There was an interesting story line about an angel in NYC working to earn his wings. Lots of famous NYC sites and personalities were included in very clever ways and the multi-media effects were fantastic. They sang and danced in the rain (yes, really!) – we are all still wondering how they did that. Some audience participation was also mixed in and we even had our own individual blinking “jewelry”! Totally fun! After the show, the group wanted to party on, so we headed over to Langan’s for some additional beverages, snacks and socializing. Overall, a great day in the city for all!